Chilling in the activity hall pre-race. What a thoroughly enjoyable race. A lot of that is attributable to the great weather (mid-40s, sunny), but the race organization and course also made it a lot of fun. The race is a 25K loop course in the Fair Hill NRMA in Elkton, MD. The vast majority is on single track trail with a couple fire roads and meadow crossings thrown in to keep things interesting. The trails were mostly rolling with minimal steep climbs and 3600 feet of total elevation gain. Basically, the entire course was runnable. I had two goals for this race – get in a nice, easy long run and see what my endurance base was. I thought I had it down on how to not race a race, but as the day progressed I started getting more and more competitive. My heart rate alarm kept beeping at me as I was running just over my 155bpm target. I stayed with it as long as I could, but after 17 miles I just threw in the towel and decided to run as hard as I felt like. Up until this point, I would grade myself at no better than a C for running within the 155bpm. I slowed to a walk fairly often in the early going as people steadily streamed by me, but it was a struggle to keep my HR under control. There were 6 miles where my average HR was above target and the rest were right about there, which meant I spent a decent amount of time above it. So with the whole “just a long training run” out the window, it was time to do some racing! I had ran conservatively for the first half plus of the race so opening it up towards the end wasn’t really all that risky despite my lack of training. Even though I ran harder, I was still walking the steeper hill sections. I checked my overall pace at mile 21 and noticed I was running faster than I had the first loop. If I could keep up the pace, I could negative split the race. This is where you run the second half faster than the first half. I’m pretty sure I’ve never done this before so this was now my new goal. And surprise of all surprises, I ended up knocking 3 minutes off my lap time! I was ecstatic. This was the answer to whether I still had any endurance base left – heck, yes! Fully trained up I could definitely have run this faster, but the fact I could handle a “fast” finish 50K training run with relative ease is a huge confidence boost. Probably more important than my physical base is the knowledge base that I’ve developed over the past 3 years. 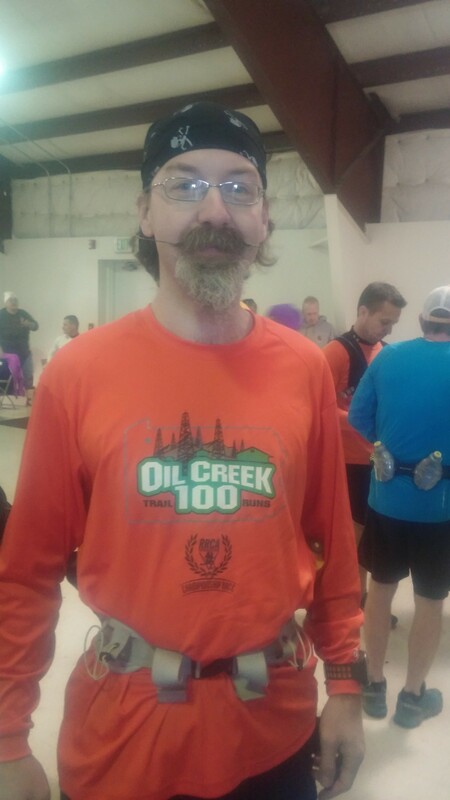 Saturday was the 10th ultra that I’ve done and while I’m not even close to being an expert, I’ve managed to learn a thing or two about how to run these races. I’ve got a good handle on how to pace myself and where my physical limits are. Specifically, I know that 20 miles of hard running is where I blow up so I try not to do this. I started running harder with 14 miles left so knew I was probably safe to open it up a little. The true value of these B or training races is to see what works and what doesn’t work. If you always do things the same way, you’ll never improve. Sure there’s a chance you may take a step back, but at least you’ll know what doesn’t work. I ended up with 2 experiments during this race that ended up not hurting me – early pacing and fueling. As mentioned before, I ran harder than planned during the first 17 miles. There wasn’t any rhyme or reason to picking 155bpm as the heart rate to race by. it just seemed like a good compromise between my MAF HR of 142 and what I consider my redline HR of about 170bpm. I’m pretty sure the correct number isn’t 160, but maybe it’s 157. I think I’ll give this a try at my next race (Naked Bavarian), which is 40 miles in early March. I tweaked my fueling a bit during this race. I normally do a gel every 5 miles. This time I did one every 4 miles after mile 10. The concern is that too many gels too quickly will lead to stomach distress. I didn’t notice any digestive differences between prior races so this was a win as well. The more calories you can keep down the better so I think I’ll see how far I can push this envelope. One every three miles may be to big of a jump, but maybe I can do 2 per 7 miles. You won’t get much bigger bang for your racing buck than this race. For $35, we got a well marked race course, 7 fully stocked aid stations, long sleeve T-shirt, finishers medal, 2 Coronas, slice of pizza, some meatballs, and fries. I’ve raced a decent amount over the past several years and you don’t get half this for most 5Ks. I know the weather will never be this nice, but the race is probably one I’ll do many more times in the years to come.